Sally Mainquist is a successful capitalist who gives money and mentoring a good name. A CPA and former KPMG auditor, Mainquist also worked in manufacturing finance and operations and as CEO of Certes Financial Pros before its acquisition. After that deal, she and business partner Kris Larson in 2014 started Veritae Group, placing financial and accounting professionals in interim roles. Last year, Mainquist and Larson shared 40 percent of the profit with employees and charities at a St. Louis Park-based search firm that's growing about 25 percent a year. Mainquist, 61, also is a hands-on volunteer and mentor to young women. Lately she's been trying to help a single-mom accountant. Who lives in Australia. This is a reach, even for the can-do Mainquist. 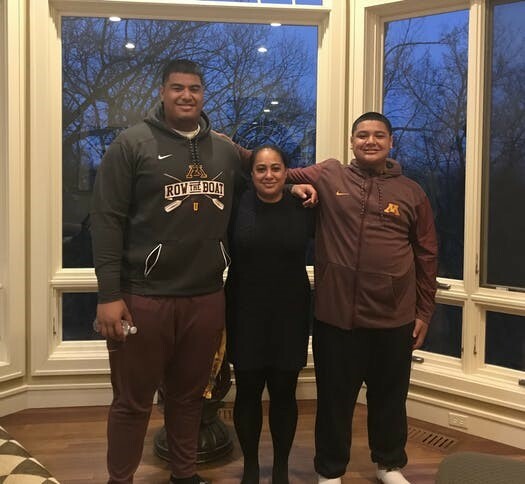 Ruth Faalele is the mother of Daniel Faalele, 18, who enrolled in January at the University of Minnesota on a football scholarship. Ruth Faalele, who spent 10 years in night school and worked days, is a corporate accountant in Melbourne. Sally Sullivan Mainquist is reaching around the world to help an Australian mom find a job in the Twin Cities. She, Daniel and younger brother Taylor, 12, are not supported by the boys' father and want to live together in the Twin Cities. Ruth, with help from her own father, raised the boys as she went to school. "I feel there is a stigma with single parents raising children," she wrote in an e-mail. "When times were challenging, my father would remind me that 'there is no shame in raising the boys in a broken home, as long as you make them happy and they know you will be there for them.' "
Ruth Faalele, 38, sent her résumé to Twin Cities accounting firms this winter. She got no takers. A friend of Mainquist's at the Boulay accounting firm sent one to Mainquist. She loves to help hard workers. "Ruth is a wonderful woman who has a stable work background in accounting," said Mainquist, who hosted the family at her home in January, when they moved Daniel to the U. "Ruth has worked the last 14 years with two companies in Australia. I was impressed with Ruth's professionalism and drive. She's very nice. Very articulate. She is trying to do right by her sons. Daniel has a great opportunity to get a good education. He knows that. "If there are any Gopher football fans out there that could … consider Ruth for employment, it would be greatly appreciated." Good workers are in demand, in accounting and otherwise. Ruth Faalele, who is a senior accountant at Delarue Tyres in Melbourne, has a degree in accounting from Monash University in that city. She will visit the Twin Cities on vacation in April so she can see Daniel and attend the Gophers spring intrasquad game. She will stay with Sally and husband Kent Mainquist, who is chief financial officer of HGA, the architectural firm. Ruth and Daniel Faalele can't move to the United States unless she has permanent employment. Sally Mainquist hopes to introduce Ruth to a few prospective employers next month. "My boys and I were always together," Faalele e-mailed me. "At a young age Daniel took it upon himself to become the 'man of the house.' He always looked out for Taylor and me. We made a pact that wherever Daniel was going to end up at college, I would try to move Taylor and I there. "Although Daniel is physically large, he is still a mama's boy."